We've all encountered them: the bullies, the wet blankets, the yea-sayers that never come through. More often than not, we're left fumbling for words, stumbling toward the door...frustrated, enraged or just plain depressed. * Identify difficult types, from the too-good-to-be-true to the too-hot-to-handle, from the perennial gossip to the eternal clam. 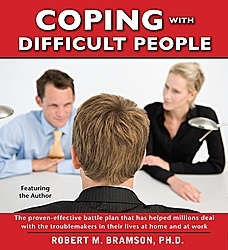 * Master the step-by-step procedures that will neutralize any negative or hostile encounter. * Understand your own style of thinking and how it affects your ability to deal effectively with each type. Maybe you can't turn 'Gloomy Gus' into 'Pollyanna'...but with the help of Dr. Bramson, you'll prevent the difficult from becoming impossible -- and end 'relation frustrations' for good!